UPDATED: Sun., Aug. 13, 2017, 10:33 p.m. 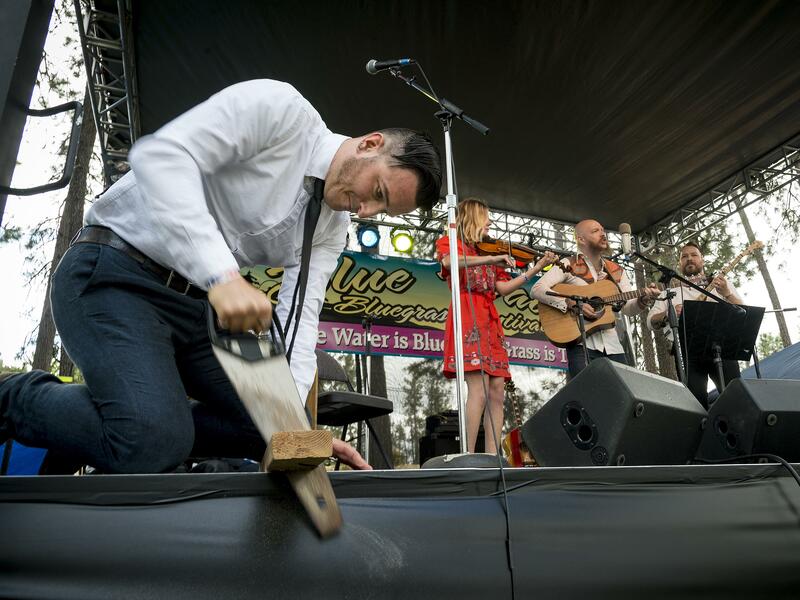 The looming threat of heavy gray rain clouds didn’t dissuade dozens of concertgoers from attending the Blue Waters Bluegrass Festival at Waterfront Park in Medical Lake on Sunday. Kitted out with colorful lawn chairs, blankets, liquids of varying alcohol-by-volume and rain gear – just in case – attendees spent a lazy Sunday lounging on green grass, an eye or ear trained on the stage. Some took naps near the serene view of the lake, while others dipped in for a swim. Most sat and watched. Children played on jungle gyms, seemingly uninterested with the soothing acoustic sounds. But not 8-year-old Aubrey and her younger sister Sierra. They gyrated to the tunes, a pair of pink and blue hula hoops spinning around their waists. “It’s very pretty,” Aubrey said of the music, while taking a break near her mother. While the hustle and bustle of Saturday’s music lineup was just a memory, people still tuned in cheerfully to Sunday’s offering, even if it was a bit more low-key. This was especially so when the Bust It Like a Mule Band took the stage – surely the oddest quartet to grace Blue Waters in years. Rather than play covers, or a set list of songs about love, life and loss, the quartet instead played tunes derived and inspired from local author Caleb Mannan’s book, “Bust it Like a Mule.” Before the musicians – comprised of Mannan’s childhood friends and his wife, Jenny Anne, on the violin – would strum and sing, Mannan would read a passage, and the band would follow. “I will be a working man, a working man,” the band sang, as Mannan sawed a piece of wood, moving the teeth back and forth to the beat. After the show, Mannan said he wrote the book as a “form of recovery” from a previous novel. He’d scrapped that one, he said, after he saw the look on his wife’s face once she was done reading it. The act struck a chord with the crowd. After their set was finished, the band received a standing ovation, and several people immediately ran over to purchase copies of the book, which tells the story of Cotton Kingfisher, a “drifter and buck wild iron python rider,” according to the book’s description on Amazon. Kevin Brown, the festival’s music director who also runs a bluegrass show called Front Porch Bluegrass on Spokane Public Radio, said groups like Bust it Like a Mule are what makes Blue Waters and bluegrass so special – the oddball acts and intimacy they share with the crowd that other shows don’t offer. Brown said he first got into bluegrass while living in Tacoma during the early ’90s. As a student of music, he said it was love at first listen when he happened to attend a local festival on a whim. Published: Aug. 13, 2017, 6:31 p.m. Updated: Aug. 13, 2017, 10:33 p.m.